Two commercial communications satellites heading for orbits more than 22,000 miles (36,000 kilometers) above Earth are scheduled for launch from a jungle launch facility in French Guiana at sunset Tuesday on top of an Ariane 5 rocket. The Sky Brasil 1 and Telkom 3S spacecraft are mounted inside the Ariane 5’s nose cone for launch at 2139 GMT (4:39 p.m. EST; 6:39 p.m. French Guiana time) Tuesday, just before sunset at the South American space base. 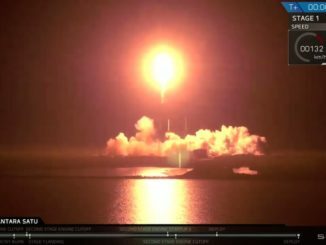 The launch window extends for 86 minutes. The 180-foot-tall (55-meter) Ariane 5 rocket rolled out to the launch pad around midday Monday, trekking along dual rail tracks 1.7 miles (2.7 kilometers) from the Guiana Space Center’s final assembly building to the ELA-3 launch zone. 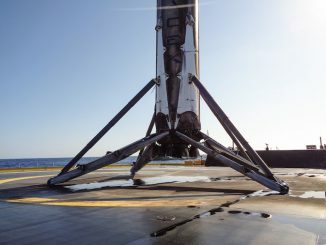 Fastened on a mobile launch table, the rocket was towed behind a diesel-powered Titan truck for the journey. 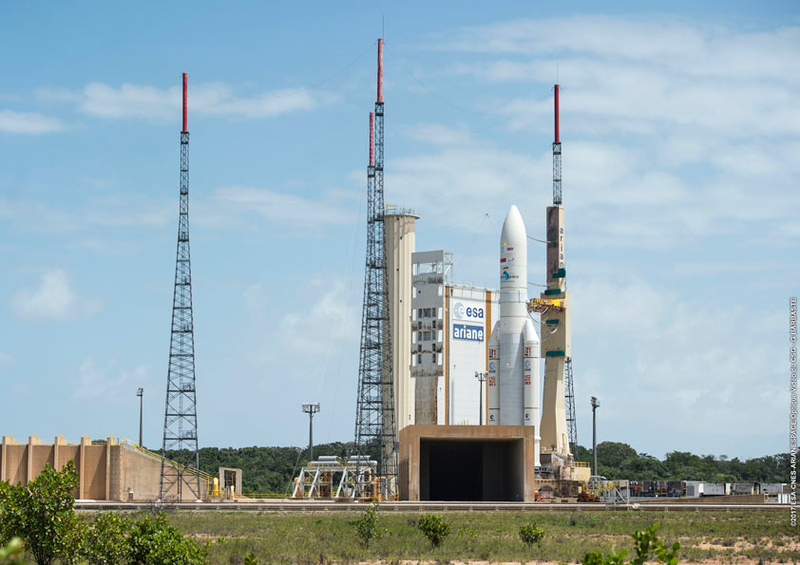 Technicians secured the rocket and its launch platform at the pad after completing the transfer Monday afternoon, connecting the Ariane 5 with the facility’s propellant lines, electrical system and ground telemetry links ahead of the start of the final countdown Tuesday morning. Tuesday’s launch will be the first of up to seven Ariane 5 missions scheduled for 2017, and the second Arianespace flight overall this year after the successful Jan. 27 launch of a Russian-built Soyuz booster from French Guiana. The two commercial satellites aboard the Ariane 5 rocket are destined for operating posts in geostationary orbit nearly 22,300 miles (35,700 kilometers) above the equator. 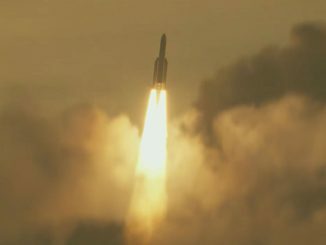 After shedding its twin solid rocket boosters and hydrogen-fueled core stage, the Ariane 5’s upper stage will deploy Sky Brasil 1 and Telkom 3S in an elliptical transfer orbit ranging in altitude from a low point of 155 miles (250 kilometers) to a high point of 22,205 miles (35,736 kilometers). The launcher will aim to place the satellites in an orbit inclined between 4 degrees north and south latitude, a low inclination enabled by the Guiana Space Center’s position near the equator. Separation of the Sky Brasil 1 satellite is expected at T+plus 27 minutes, 25 seconds, followed by the jettison of the Ariane 5’s Sylda adapter structure to expose the Telkom 3 payload for deployment at T+plus 39 minutes, 43 seconds. On-board thrusters on each craft will circularize their orbits and move them into position directly over the equator. Sky Brasil 1 will support a subscription television service operated by DirecTV Latin America, a subsidiary of AT&T. Built on Airbus Defense and Space’s Eurostar E3000 satellite platform, the new telecom craft will cover Brazil with high-definition television broadcast capacity. The European-made satellite, fitted with 60 Ku-band transponders, weighs more than 13,000 pounds (about 6 metric tons) with a full load of fuel. The spacecraft’s on-board propellant will boost Sky Brasil 1 into a circular geostationary orbit within a few weeks of launch, eventually guiding the satellite to a position along the equator at 43.1 degrees west longitude. DirecTV Latin America is partnering with Intelsat on the Sky Brasil 1 project. Intelsat is considered a minority owner of the satellite, which it calls Intelsat 32e, responsible for supplying the radio spectrum for Sky Brasil 1’s direct-to-home broadcast services. Intelsat plans to tap a portion of the new satellite’s capacity to feed Internet signals to airline and cruise ship passengers in the Atlantic and the Caribbean. 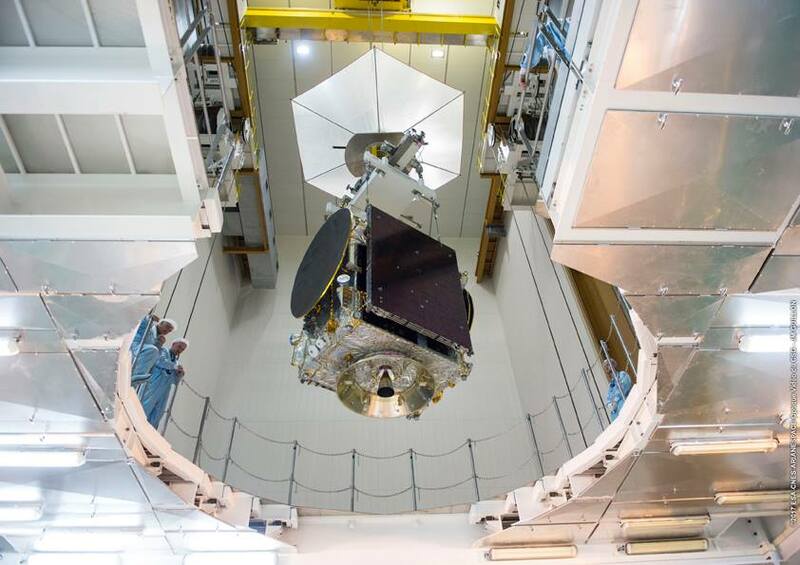 Expected to operate for up to 19 years, Sky Brasil 1/Intelsat 32e will replace the aging Intelsat 9 satellite currently occupying the 43.1 degrees west location, and augment services currently provided by the Intelsat 11 spacecraft in the same geostationary slot. Intelsat 9 has been in orbit since July 2000 after its blastoff on a Sea Launch Zenit 3SL rocket, while Intelsat 11 launched on an Ariane 5 mission in October 2007. The Telkom 3S satellite is designed to support high-definition television broadcasts, communications on-the-go, and broadband Internet services. Owned by Telkom Indonesia, the satellite carries 32 C-band and 10 Ku-band transponders. From its final geostationary perch at 118 degrees east longitude, Telkom 3S will reach customers across Indonesia, Malaysia and other parts of Southeast Asia. 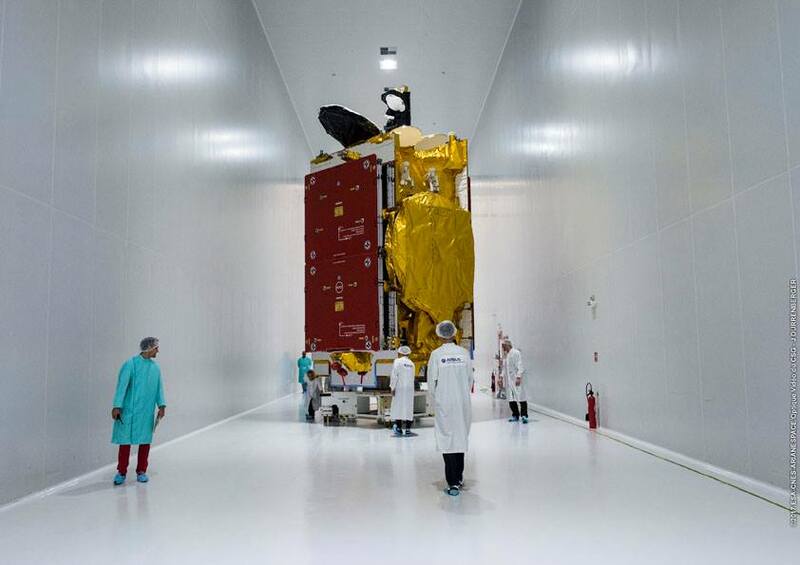 The 7,826-pound (3,550-kilogram) satellite was built by Thales Alenia Space. “Telkom 3S will start its mission at 118 degrees east longitude to replace Telkom 2 in early April of this year and last for almost 18 years, thanks to the (fuel) tank capacity and the high performance of Ariane 5,” said Lionel Pelenc, Telkom 3S project manager at Thales. The Telkom 2 satellite lifted off in November 2005 on another Ariane 5 mission. Telkom Indonesia ordered the Telkom 3S spacecraft from Thales in 2014 after an upper stage failure stranded the predecessor Telkom 3 satellite in an unusable orbit following launch on a Russian Proton rocket in August 2012.